Why did Filipinos come to Hawaii? ONE HUNDRED YEARS ago, at Honolulu Harbor, the 20th of December would have been just another day of ships coming and going. But at 3 o'clock that afternoon, some curious onlookers had crowded around the docks to witness the arrival of 15 Filipinos on board the SS Doric. Honolulu residents had previously seen Chinese, Japanese and Korean arrivals, but not Filipinos. Why were Filipinos coming to Hawaii? » 100: Time to celebrate! The legacy of the first 15 Filipino arrivals, known as sakadas (farm workers), was honored at the opening ceremonies of the Filipino Centennial in Hawaii yesterday at the Hawaii Convention Center. The centennial celebration runs through December 2006. The state Legislature established a Filipino Centennial Celebration Commission to oversee this yearlong observance in honor of the sakada pioneers. Actually, they were not the first Filipinos to set foot on Hawaii. A few who were known as "Manila Men" were reported to have been in Hawaii at the time of the monarchy as cooks and musicians. Two also were reported as having petitioned to become citizens of the Kingdom of Hawaii. At least six were known to be involved with the Royal Hawaiian Band and one of them with the surname Libornio played an important part. But 1906 marked the beginning of an aggressive campaign for the recruitment of Filipino farm laborers by the Hawaiian Sugar Planters Association (HSPA) to work on the sugar plantations in Hawaii. Sugar was king in those days, and newly opened plantations were in desperate need of a plentiful labor supply. By the 1930s the sakadas had become the majority of the plantation workforce, replacing the Japanese. This caused some tension between the two competing ethnic groups. 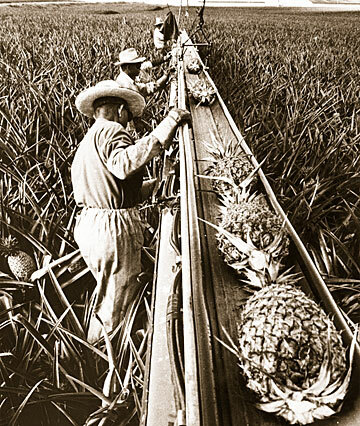 Many Filipinos came to Hawaii to work in the pineapple and sugar fields, in hopes of creating a better life. Workers at California Packing Corporation's Wahiawa plantation harvest pineapples in this scene from the mid-1960s. The annexation by the United States of two foreign territories -- Hawaii and the Philippines -- would have profound implications for the burgeoning sugar industry. The annexation of Hawaii opened up additional acreage for sugar cultivation and producers were given privileges similar to those on the U.S. continent. However, annexation made American laws applicable to the new Territory of Hawaii, which was formally annexed by the United States on June 14, 1900. According to Edward Beechert, labor history expert and retired University of Hawaii professor, "working under federal law, using free labor, would require the development of new techniques of control if the (sugar) planters were to maintain their position of power." Two such American laws, which hurt the labor supply to the plantations, were the Chinese Exclusion Act of 1882 and the Foran Act of 1885. The first prohibited Chinese laborers, stigmatized as the "yellow peril," from entering the country for 10 years, and the latter was intended to limit Asian immigration beyond the Chinese Exclusion Act. It prohibited the payment of transportation costs for contract labor prior to immigration. In view of these repressive laws, many Chinese, Japanese and Portuguese workers left the plantations. The planters' dilemma therefore was to find new sources of labor. The HSPA brought in "trial groups" from Puerto Rico, Korea, Russia, Spain, India and the Philippines. The annexation of the Philippines on Dec. 10, 1898, through the Treaty of Paris made it a colony of the United States, a godsend to the planters. This meant that as American subjects, Filipinos could be recruited to work on the Hawaii sugar plantations without any immigration restrictions. As early as 1901, when the Philippine-American War was still raging, the HSPA had suggested to Washington that Filipinos, now under American colonial rule, could be recruited to work on the Hawaii plantations. Later a U.S. Senate Report (1903) of the Hawaii Labor Commissioner mentioned the vigorous demands of planters to have a government bureau of immigration created for the purpose of "superintending (sic) the importation of foreign laborers and the introduction of immigrants." A new era, which would dramatically alter the demographic future of Hawaii, had begun. As an American colony with a very large rural population, the Philippines promptly became the primary source of cheap labor for the Hawaii plantations. By 1909, the only other source of labor was Puerto Rico, another U.S. colonial possession, but the Philippines was the dominant recruitment pool. Before 1920, the largest group of sakada recruits came from the Visayan islands in central Philippines. The sugar industry was already a booming one in the Visayas, particularly on Negros island. A few Tagalogs were also among the early recruits. Pablo Manlapit, who became the most militant Filipino labor leader in Hawaii and led various strikes on the plantations, was from Batangas province south of Manila. After 1920, HSPA recruitment was largely confined to the Ilocos region in northern Luzon, a narrow coastal strip of land where life was hard, the population dense and the land not fertile for agricultural purposes. The vast majority of Hawaii's Filipinos came and continue to come from this region in northern Philippines. They were the prime candidates for plantation labor because Ilocanos (also spelled Ilokanos) are known for their work ethic, industry, frugality and simplicity. By the time the sakadas arrived, the oppressive plantation system was already entrenched. Their most difficult years were those following 1906 up to the end of World War II. During this period, according to Ruben Alcantara, another former UH professor and author of a doctoral dissertation on the sakadas, "plantation work consisted of 12 hours in the sugar mill, or 10 hours in the cane fields interrupted only by a 15-minute breakfast, a 30-minute lunch and occasional pause for water." Their wages were measly, only adequate for the needs of single men. Those who left wives or families in the Philippines could not afford to bring them over to Hawaii. There were also stories about the practice of "coboy-coboy," or abducting other men's wives on the plantations. Alcantara concludes, "Long separation from their families, a scarcity of feminine companionship, feelings of discrimination and low status on the plantation labor hierarchy combined to place a heavy burden on the shoulders of these pioneer workers." Even so, the 15 pioneers would soon be joined by thousands of their compatriots, thanks to the relentless propaganda of the planters. The HSPA showed movies of idyllic plantation life with opportunities for easy riches. Hawaii was portrayed extravagantly as kasla glorya (like paradise). Innocent Filipinos, wrote Bruno Lasker, were easily duped into mortgaging properties or borrowing from relatives to pay their passage to Hawaii. Once in Hawaii, the sakadas would send money to the homeland, giving the impression that they had struck it rich in Hawaii. Between 1906 and 1930, the HSPA had brought in approximately 120,000 Filipinos to Hawaii. Comprising only 19 percent of the plantation workforce in 1917, the sakadas jumped to 70 percent by 1930. They increasingly got involved in strikes on the plantations. One of the most tragic incidents was the infamous 1924 "Hanapepe Massacre" in which 16 Filipinos and four policemen were killed. The 1937 strike by thousands of Filipino workers in Puunene, on Maui, resulted in major benefits, but the organizers were arrested and labor leader Manlapit was deported from Hawaii permanently. The last group of 6,000 sakadas from the Ilocos arrived shortly before Philippine independence was regained from the United States in 1946. After that the quota was limited to 50 a year, later increased to 100. It was only toward the late 1950s that immigration laws enabled Filipinos already in Hawaii to get their families beyond the quotas. And in 1965, immigration laws were liberalized to admit not only family members but also professionals, including doctors, nurses, engineers, lawyers, accountants, teachers, health technicians and others with college educations and marketable skills. The 2000 Census lists the Filipino and part-Filipino community as numbering more than 275,000, or nearly 23 percent of the Hawaii state population. Current immigration from the Philippines at 4,000 a year and a higher birth rate than other groups will accelerate the community's growth, making it very much a part of Hawaii's future. Belinda A. Aquino is professor of political science and director of the Center for Philippine Studies, University of Hawaii at Manoa. She also is a member of the Filipino Centennial Celebration Commission.